Henry Moyer built the Sharon House (left) in the 1850's. It had wide porches and housed a variety of shops at street level. Later, under the proprietorship of B.P. Sharp & Son, a brochure states: "The Sharon house enjoys the finest location in the village, being situated on Main Street directly opposite the Springs and baths. The house is handsomely furnished throughout in birdeyes maple, curly birch, and quartered oak. The decorations are both elegant and in perfect taste." The brochure also claimed their livery was one of the finest in the country, with horses and carriages equal to any city establishment. The Sharon Academy Theater (above), located on South Street, was connected to the Sharon House by enclosed corridors. On November 21, 1936, a mysterious fire broke out and devastated the block, consuming thirteen buildings. The loss included the Sharon House, its livery stables, the Academy Theater, Elgen's store, the telegraph office, a doctor's office, the "Bee Hive” curio shop, the Spring House, a residence, numerous barns and ice houses. The fire was the worst in Sharon Springs' history and changed the face of Main Street forever. Erected 1999 by The Sharon Historical Society. Location. 42° 47.774′ N, 74° 37.006′ W. Marker is in Sharon Springs, New York, in Schoharie County. Marker is on Main Street (New York State Route 10), on the right when traveling north. Touch for map. Marker is in this post office area: Sharon Springs NY 13459, United States of America. Touch for directions. Other nearby markers. At least 8 other markers are within walking distance of this marker. A different marker also named Historic Main Street Tour (a few steps from this marker); Chestnut Street Schoolhouse (about 300 feet away, measured in a direct line); The White Sulphur Spring (about 400 feet away); The Magnesia Temple and Baths (about 500 feet away); a different marker also named Historic Main Street Tour (about 600 feet away); a different marker also named Historic Main Street Tour (about 600 feet away); The Lehman Block (approx. half a mile away); Rockville (approx. half a mile away). 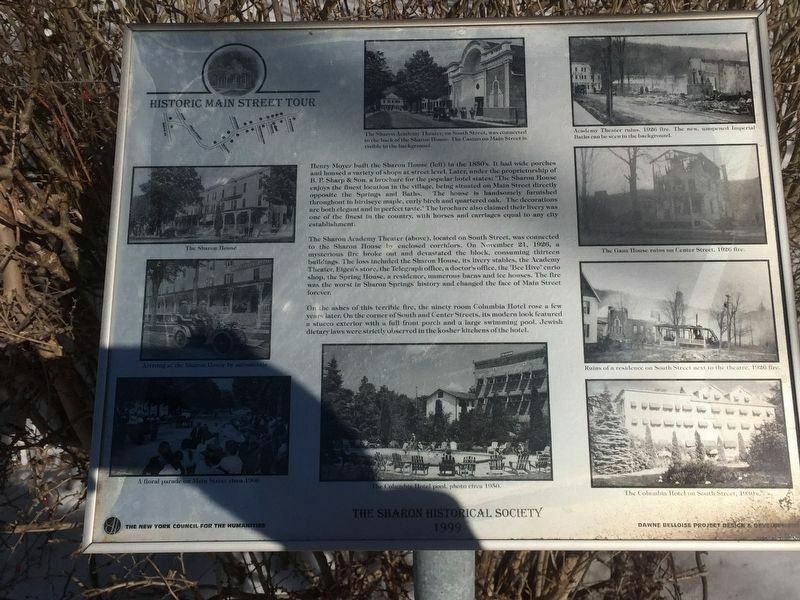 Touch for a list and map of all markers in Sharon Springs. More. Search the internet for Historic Main Street Tour. Credits. This page was last revised on March 15, 2019. This page originally submitted on March 11, 2019, by Steve Stoessel of Niskayuna, New York. This page has been viewed 29 times since then. Photo 1. submitted on March 11, 2019, by Steve Stoessel of Niskayuna, New York. • Bill Pfingsten was the editor who published this page.